Designed with musicians in mind, the EZ-RYZE SOLO Footrest from Mey Chair Systems offers virtually effortless adjustment of height for optimal performance posture. Users can easily access the release button with their heel, engaging the gas spring to gently raise or lower the single-foot platform to any point between 4.3" and 12.6". 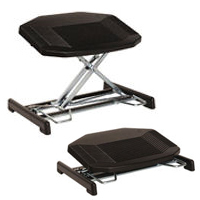 The non-locking platform tilts freely between 0° and 30°, encouraging flexing of the feet and ankles during use. Arced ridges on the platform prevent the foot from slipping. 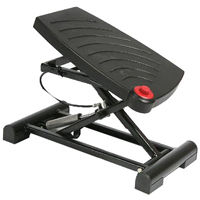 The Rocking Footrest employs a sturdy minimalist design and high-impact plastic construction to provide a dynamic footrest without the risk of breakage created by moving parts. The curved base provides effortless movement to accommodate the desired angle at the ankle, including a rocking movement. (Note: The platform cannot be locked in position). 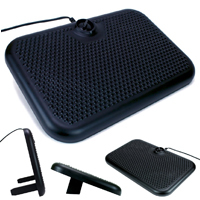 The base also features rubber padded feet to keep the footrest from moving during the rocking motion. The platform is 17.7" x 13.8" and is textured with lateral ridges to reduce the possibility of the feet slipping off the platform. The Footform Dual Footrest offers two ranges of variable height adjustment, providing foot support ranging from 2.5" to 12.5". The foot platform sits at a fixed 10° angle and is infinitely adjustable throughout the two ranges. 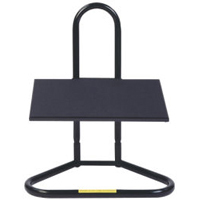 This large heavy-duty plastic platform is textured to offer both stability and safety. The simple foot-operated locking mechanism is released via a single button which then permits the adjustment of the spring-loaded platform. Many years of reliable service can be expected from the robust steel base and elevating mechanism. NOTE: Due to the level of spring resistance smaller users may find adjustment less than ideal. The Pro 959 Foot Actuated Footrest from Bakker Elkhuizen is a sturdy, adjustable footrest with a metal base and an extra-large, plastic foot platform with raised ridges. The extensive height range on the Pro 959 can be adjusted by means of a large button located at the back of the platform. The button is simple to use and easy to find with the foot. The non-locking tilt mechanism on the platform encourages movement of the feet and ankles, and allows the user to find the most comfortable inclination, from neutral (flat) to positive (dorsiflexion). 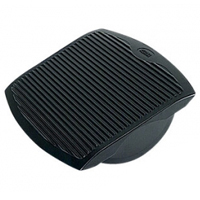 Rubber feet on the unit ensure stable, slip-proof positioning. The large size and wide range of height adjustments make the Pro 959 ideal for multiple users at flex workstations. Caution: The Pro 959 should not be used as a foot stool. Do not stand on the footrest. This product uses a powerful spring mechanism. Adjust the height only with the foot, and only when seated. 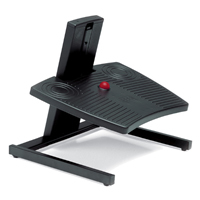 The Plastic Adjustable Foot Rest with Metal Base from 3M provides users with a large non-locking platform surface that features foot-activated tilt ± 20° from level. 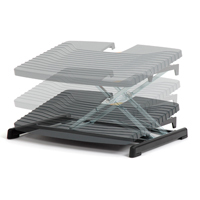 The base of the foot rest is formed from lightweight sheet steel for weight and stability. 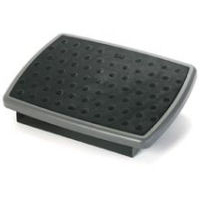 The foot platform is of rigid plastic with an embedded softer anti-slip surface layer. Softly raised bumps on the surface aid in keeping the feet in position and can offer a massaging effect when footwear is removed. A single height adjustment from 4" to 4.75" can be performed using wing nuts and thumb screw connectors. 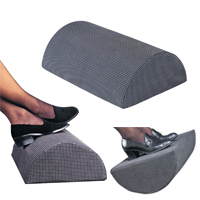 3M Safety Walk anti-slip material is used on the underside to ensure the foot rest remains securely positioned.